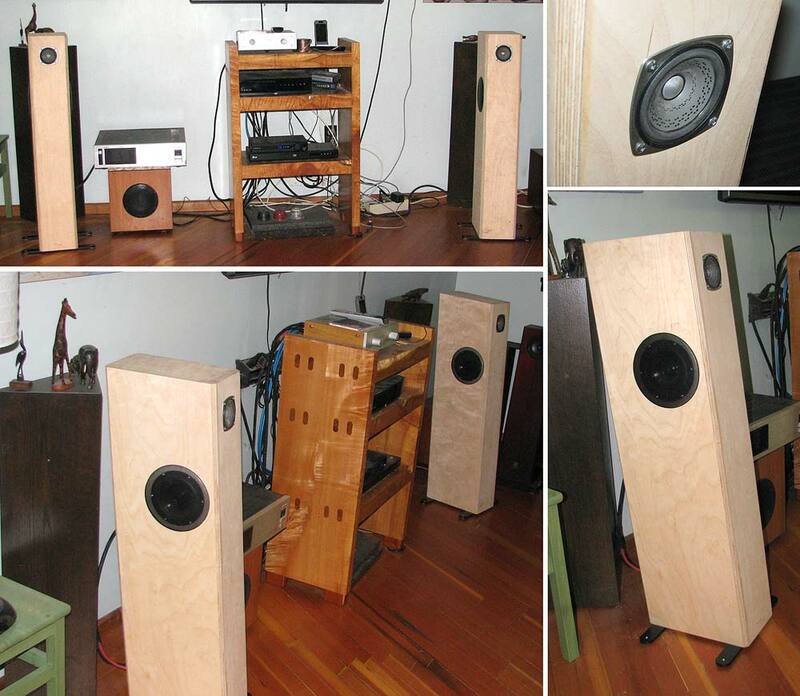 I have recently built a clone of the Nola Brio Trio speakers and really enjoyed them. I then started thinking about one of the bigger speakers that they make and how they might sound. I have built something similar to the Nola Micro Reference. The original has a ribbon tweeter, a 4" full range in an open baffle configuration, and two 5" woofers in a ported enclosure for the low end. I am currently playing around with two Tymphany TC9FD18-08 3-1/2" for the top end (I have no ribbon tweeters yet). For the low end, I am using my 6" Seas driver from my LXmini speakers. I have been using the MiniDSP to play with these a bit and they sound really good. I was wondering if anyone could suggest some reasonably priced 5" woofers that I might try in the bottom end and some ribbons for the top end (even though I like the Tymphany TC9FD18-08 3-1/2")? Any other thoughts on these would be appreciated. Hi Wendell, I have always considered Peerless SDS woofers to be an extremely good buy, for the money, and what you could pull out of 5,25" in a 25 litre vented cabinet is astonishing. Two of those in parallel would do good for dynamic reserves and increased sensitivity. Among ribbon tweeters I find Beston and Fountek decent and the price is within reason. Or, if the room placement can accommodate it, try a pair of the SDS in side mounted push-push. I've built a couple of pairs of 2-ways using multiples of the smaller 830870, and they never cease to amaze with the depth and volume of LF they can deliver. As for ribbons, I don't have much experience there - unless you want to stretch your definition to the ESS AMT, which I consider one of the best HF transducers around. Or, try a Z frame. I did this with 8" woofers but it would work with other sizes as well. XRK was working on this and I tried it and liked it. It gets pretty low. I believe XRK measured his in the 30's. My measurements attached. The Silver Flute W14, really quite a bargain, and fits a smaller box than the excellent Peerless 830870. The W14 fits in reflex enclosures 5-10 litres (or double that for 2). We use them in a push-push ML-TL that sims to 35 Hz (F10). I also concur with Chris about the TG9 which i found considerably better than the TC9 (which i was very disappointed with). And there are even better small FR if you have a bigger budget. I like Peerless as well, but my next 5" build will have a FaitalPRO 5FE120 in it based on lots of comments here. The MLTL that Dave mentioned above is the TysenII - and they certainly dig deep. If I cared enough about the numbers, I might sometime get around to getting my hands on a decent mike and measuring software, but that's a ratzazz I have none to give. Tysen V2 (now veneered and very pretty.